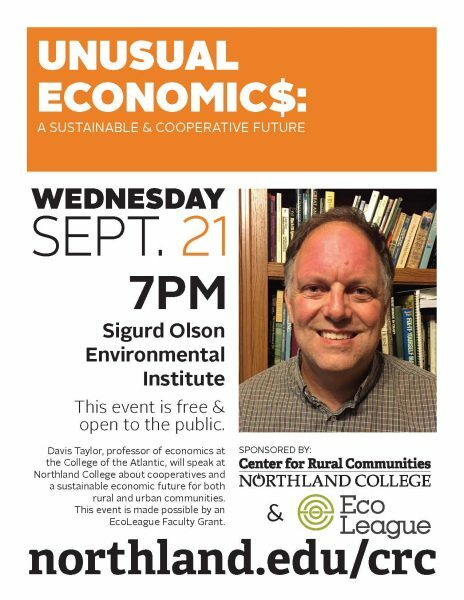 Davis Taylor, professor of economics at the College of the Atlantic, will speak at Northland College about cooperatives and a sustainable economic future for both rural and urban communities Wednesday, September 21 at 7 p.m. at the Sigurd Olson Environmental Institute. This event is sponsored by the Northland College Center for Rural Communities and the EcoLeague, a consortium of six colleges and universities that share missions based on environmental responsibility and social change, including College of the Atlantic and Northland College. Davis’ visit is made possible by an EcoLeague Faculty Scholar Grant, which encourages faculty at member schools to collaborate with each other in areas of teaching and research across institutions. Taylor pursues research in various forms of economics as well as sustainable community development. He has presented papers that expand upon the concepts of community and model the human ecology of forests. His current research efforts include the economics of food systems, the role of institutions in shaping economic development, and the ecological economics of resource collapse.